Kenya's opposition says it will boycott companies run by allies of President Mwai Kibaki in protest at the outcome of last month's presidential election. The Orange Democratic Movement's (ODM) change of tactics came as police shot five dead on a third day of rallies. 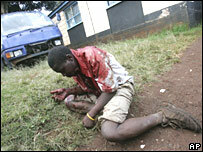 One protester died in Mombasa and four were killed in Nairobi. The post-poll violence has left 600 dead. Five bodies of people from Mr Kibaki's Kikuyu ethnic group were found with arrow and machete wounds, police said. It was not clear when they were killed. Kenya's National Commission on Human Rights has cast doubt on the vote that returned President Kibaki to power. At a news conference in Nairobi, the state-sponsored body listed a catalogue of irregularities in a report entitled "Thirty Hours that Destroyed Kenya". It catalogued a series of what it described as electoral offences such as turnouts of more than 100% in some constituencies and the obstruction of election observers. The commission said at least 360,000 votes could not be verified - in a vote where the two candidates were separated by about 230,000 ballots. ODM leader Raila Odinga has demanded a re-run of the election. The UN announced that Kofi Annan, its former secretary general, would fly to Kenya on Tuesday to help mediate between Mr Kibaki and Mr Odinga. Two members of Mr Annan's team - ex-Tanzanian President Benjamin Mkapa and Graca Machel, wife of ex-South African President Nelson Mandela - have already arrived. ODM spokesman Salim Lone told the BBC that from next week, the opposition would switch to other forms of action, such as boycotts of firms run by what he called the government hardliners. He mentioned specifically the Brookside Dairies, Equity Bank, and City Hopper bus services as possible targets for action. The ODM launched a third and final consecutive day of nationwide protests on Friday. In Mombasa, police clashed with a group of Muslims who tried to march through the coastal city after Friday prayers in protest at the election results. Officers opened fire, killing one protestor and injuring at least five others, police said. In Nairobi, police confronted demonstrators in the Kibera slum after more than 600 youths tore up a section of railway track running through the centre of the area. Officers fired tear gas and live rounds leaving four dead. A member of the president's Kikuyu community died after being pierced with a poisoned arrow shot by Masai youths, police said. The death at the town of Narok came amid inter-communal violence which saw homes and shops set ablaze. Four other members of the Kikuyu group were killed with bows and arrows and machetes in the area, which is beside Kenya's premier Masai Mara game reserve. The latest deaths bring to 21 the number of people killed during three days of opposition protests. Mr Odinga said police were turning the country into "killing fields of the innocent, executing at will in an unprecedented bloodlust". But police said their response had been restrained and officers had only fired at rioters and looters. 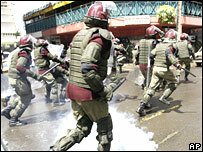 Public demonstrations were banned by police immediately after Mr Kibaki's swearing-in on 30 December. The European Parliament unanimously backed a resolution on Thursday calling for the EU to suspend aid to the Kenyan government. Meanwhile, the UN has launched a $34m (£17.3m) appeal for Kenya to help those affected by the recent unrest, in which a quarter of a million people have left their homes.